Now you can enjoy the benefits of green tea without the caffeine! 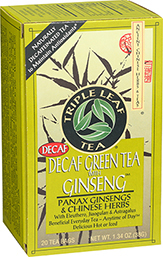 Drink Triple Leaf Decaf Green Tea as often as you like anytime of day. 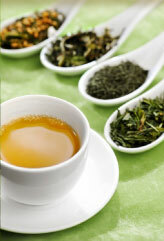 Experts recommend drinking three or more cups of green tea a day. 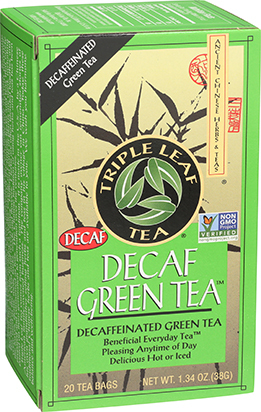 Our Decaf Green Tea is naturally decaffeinated using a carbon dioxide process that maintains green tea’s beneficial antioxidants. * Carbon dioxide occurs naturally in air. It gives carbonated mineral waters their fizz! 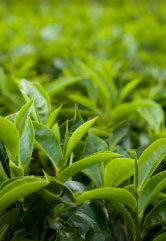 Green tea has been used in China as a healthful beverage since around 3000 B.C. 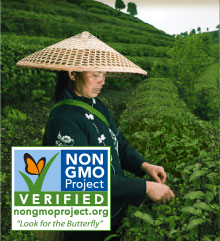 Today, we know green tea is rich in polyphenols, a group of powerful antioxidants. 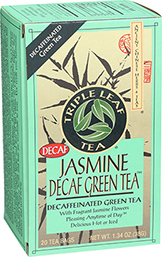 * Our Decaf Green Tea has a pleasing mild flavor,without the bitterness associated with some green teas. It is delicious hot or iced. Enjoy it as is, or try adding lemon and your favorite sweetener. 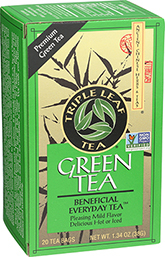 Gain all of its benefits by drinking green tea every day — just as Asian people do! HOT TEA: Pour 1 cup of boiling water over a tea bag. Let steep 3-5 minutes, Remove the tea bag, squeeze gently into cup. ICED TEA: Pour 1 cup of boiling water over 2 lea bags. Let sleep 3.5 minutes. Remove the tea bags, squeeze gently, then add ice..